Colorado isn’t just about hops and ales, we also have an abundance of award-winning wines too. The unparalleled natural beauty of the area, plus the abundance of wine, make the Pikes Peak region a perfect pairing for every wine lover. Whether you’re interested in wine tastings, tours, or to just enjoy a glass, we’ve got you. From sipping Creekside in the shade of willow trees to serene grounds of The Holy Cross Abbey with a backdrop of the Wet Mountains, there’s a wine stop to suit everyone’s palate. Those looking for more of an adventurous tasting could book Raft Masters “Whitewater to Wine” tour or The Royal Gorge Route Railroad’s Wine Dinner. Full-bodied? Light and airy? Fruity? Earthy? You want it, we got it. 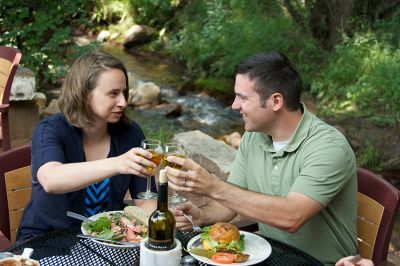 Wine down with us here in the Pikes Peak region. Offering something special for the wine-lover in all. Our new winery has a tasting room and event space. More information to come! Enjoy espresso, specialty coffees, loose-leaf teas, Belgian hot chocolate, tapas, cheese plates, shaved Italian meats, salads, and pastas. Groups welcome! We can perform receptions, tours, and wine tastings. We have a variety of wines to try! We sell 500 cases in our tasting room.